The traffic oval at Spring Hill and Quarry Road. The Benton County Public Works staff has reviewed the small oval “roundabout” at Spring Hill Drive and Quarry Road and is now recommending that it be removed and not replaced with a bigger one that is actually round. North Albany resident Chuck Kratch had been asking for just that. Kratch gathered 182 signatures on a petition he presented in September, first to the Albany City Council and then to the Benton County Board of Commissioners. The traffic oval was installed this spring to handle detour traffic on Quarry Road during the reconstruction of North Albany Road, now completed except for “bioswales” to catch rainwater. The oval was supposed to be temporary, but the council asked the county to keep it in place as a way to slow traffic on Spring Hill. The commissioners at first agreed. But as a long-term feature the oval would have to be replaced with a larger circle. This, Wheeler says, would cost about $500,000, and spending that kind of money there would prevent county road and bridge work elsewhere. “We feel road maintenance and bridge replacements are higher priority than the roundabout,” he wrote. The intersection has had no problems with accidents or congestion that would warrant a roundabout. And while the oval reduces speeds, Wheeler wrote, “the reality is that speeds, while dangerous, are not causing accidents on this section of Spring Hill.” He also believes a bigger roundabout would reduce property values on its southwest side. 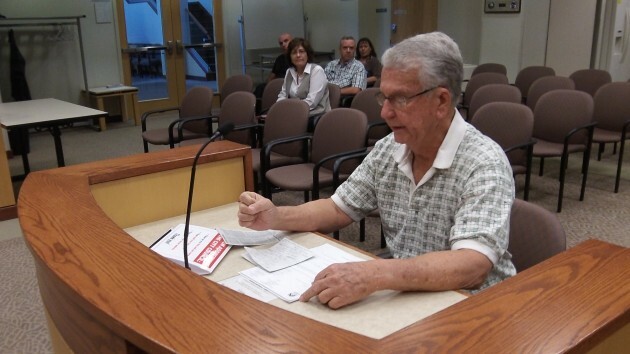 Chuck Kratch presents his roundabout petition to the Albany council on Sept. 9. This egg shaped roundabout has outlived its usefulness. It also presents problems for those of us who drive school buses around it daily. If this roundabout were made to be larger, it would be very difficult to negotiate it for those of us driving very large vehicles. It is my hope that it is removed completely. Returning the intersection to its original configuration was always the best solution. If speed is that big a concern, either now or in the future, two more stop signs can be added to make it a 4 way stop. 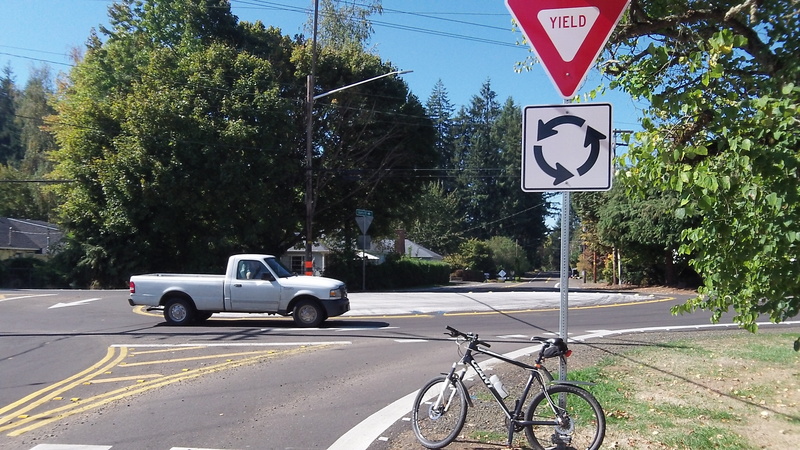 MANY stop signs can be bought and installed for what one roundabout costs to build. It’s interesting that when the “oval-about” was decided upon, that one of our city councilors (Collins) asked that a flagger be provided to assist the traffic flow through the intersection. Then the council as a whole requested it to stay in place…..and finally it takes a citizen petition to get the wheels turning to revert back to its prior configuration. No wonder some of us (citizens/taxpayers) get frustrated with local government, and this is just a minor example. At least common sense is going to (finally) prevail in this case, it would appear. We may have saved tax payers $500k +/-. Not strictly true. The taxes paid stay the same. You didn’t “save” anything as the money will be used on other projects, which the engineers indicate have a higher priority. Mr. Kratch, there’s nothing wrong with what you did. It an appropriate way to interact with other folks through the people’s government. But folks need to stop and understand these decisions need to be guided by a whole gamut of issues that the traffic engineers must be aware of to make sound recommendations. Accident rates and speeding are a couple of issues. Others include zoning of undeveloped land and expected growth in the area, and other development that might be expected to change traffic patterns. “Common sense” of folks is often wrong, especially when they only see what is before them today. There are several traffic circles now in use that have markedly improved traffic flow, at a far lower cost than signalized intersections and other measures, that people vehemently opposed with their “common sense”. Some of those same folks have even praised them now they were completed. Traffic engineers are professionals, and Albany is blessed with a particularly good one. That track record is why the Council will usually take their advice. A true “circle” would’ve been preferable than the oval shape. Get rid of it.